Mickler, P.J., Ketcham, R.A., Colbert, M.W. and Banner, J.L. (2004) Application of high-resolution X-ray computed tomography in determining the suitability of speleothems for use in paleoclimatic, paleohydrologic reconstructions. Journal of Cave and Karst Studies, 66(1), 3-8. 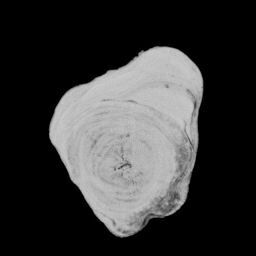 Animation of CT slices from speleothem AH-1 from top of sample to bottom. Bright grays correspond to solid carbonate; darker grays correspond to fluid inclusions, voids, and other low-density components. Image field of view is 180 mm. 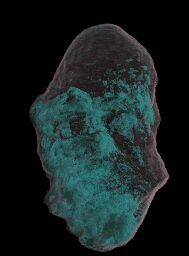 Three-dimensional volume rendering of sample AH-1 in which majority of speleothem has been been rendered transparent, with voids, fluid inclusions and other low-density areas rendered in blue. Inclusion patterns indicate more than one growth direction. Specimen is 235 mm high. 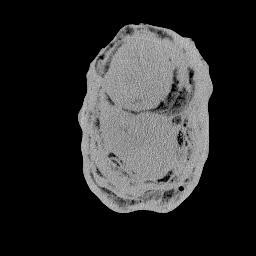 Animation of CT slices from speleothem ANY-01 from top of sample to bottom. Image field of view is 155 mm.